The territory which became nationally known as “Bleeding Kansas” was settled with but a few New England abolitionists, some 16% of the population as reported at that time. Settlers from the northern Border States added about 35%; migrants from the southern parts of Ohio, Indiana, and Illinois contributed an estimated 22%. The open prairies characteristic of Kansas did not hold allure for settlers from the South; they made up only 13.5% of the population. On the other hand, Western Missouri’s settlers mostly hailed from the southern states of Kentucky, Tennessee, and Virginia. Prior to the Civil War, the Democratic Party was the majority party in Missouri, led by powerful political figures like Thomas Hart Benton and Andrew Jackson. Many of the older county history books and publications, probably lacking some statistical veracity, reported that the Upper Counties of Northwest Missouri were 60% Democratic, many counties sympathetic to the Southern cause by a two-to-one ratio. As the Civil War progressed toward its end, the percentage of settlers from northern, Midwestern, and eastern states greatly increased and politics changed. By the end of the war in 1865, Northwest Missouri was in the grasp of the united Republican Party as Democrats loyal to the Union regrouped with the Republicans. Turbulent times still defined Missouri. “Scratch a Democrat and you find a rebel” was a rally slogan used by the Republican Party in the 1868 election. “Waving the bloody shirt” was a common gesture underscoring the message from Radical Republicans, blaming Democrats for the bloodletting of the war. Most farmers and town folks living in the rural Upper Counties of Northwest Missouri simply wanted a return to normalcy. Women widowed by the war as well as widowers remarried as soon as possible to provide family security. “Bounty” lands were issued to widows and children of veterans. Available farmlands attracted eastern and foreign families seeking nature’s bounties and promises of new fortunes opening on the western front of the newly renovated nation. People were ready for peace! But the years immediately following the Civil War were tough ones for Missouri Confederate soldiers and sympathizers. These defeated ones were no longer allowed to vote. Union friends and neighbors were sharp with their tongues and icy with their stares. Violence, if less widespread, was ever more clandestine and even increased. Some Union militia decided victory in war provided a peacetime license to kill any pro-Southern lover or relative who went afoul of their scrutiny. This stage was set during the autumn of 1864 when the Radicals swept into power by a statewide election. the Radicals immediately found approval from the General Assembly for the election of a constitution convention. The convention was held from Jan. 6, 1865, to April 10, 1865. The new constitution was signed one day before the 66 delegates adjourned the convention. The Radicals successfully forced a new constitution with harsh and vindictive measures aimed at Southern sympathizers. Along with emancipating Missouri’s slaves, they passed a bill to oust an estimated 800 officeholders. The bill removed all state judges, circuit attorneys, sheriffs, and county recorders from office. Radical Republicans were named to fill these vacancies. The Constitution of 1865 passed the “Ousting Ordinances” to prevent the emancipation bill, and other acts that they thought might be unconstitutional, from being overturned. One of the most abusive, vengeful, and high-handed measures, even to the sensibilities of Conservative Republicans, called “The Ironclad Oath.” To vote, hold office, or practice professions like law, education, or the ministry, eligibility required the candidate to sign “The Ironclad Oath.” Eighty-six acts were listed by the convention as “disloyal” and would deny a person’s voting rights. “I, A.B., do solemnly swear, that I am well acquainted with the terms of the third section of the second Article of the Constitution of the State of Missouri, adopted in the year eighteen hundred and sixty-five, and have carefully considered the same; that I have never, directly or indirectly, done any of the acts in said section specified; that I have always been truly and loyally on the side of the United States against all enemies thereof, foreign and domestic; that I will bear true faith and allegiance to the United States, and will support the Constitution and laws thereof, as the supreme law of the land, any law or ordinance of any State to the contrary notwithstanding; that I will, to the best of my ability, protect and defend the Union of the United States, and not allow the same to be broken up and dissolved, or the Government thereof to be destroyed of overthrown, under any circumstances, if in my power to prevent it; that I will support the Constitution of the State of Missouri; and that I make this oath without any mental reservation or evasion, and hold it to be binding on me. Henry Clay McDougal, a well-known and highly regarded attorney and judge from Gallatin and later Kansas City, Missouri, presented a dissertation to The State Historical Society of Missouri at Columbia on March 8, 1904. In his oratory entitled A Decade in Missouri Politics – 1860 to 1870 – From a Republican Viewpoint, Judge McDougal singled out many “life-long Democrats who will be remembered and honored with pleasure and pride by every loyal Missourian as long as Missouri is known in history.” Included in his list were two men from the Upper Counties: Colonel J.H. Shanklin, Trenton, Grundy County, and Judge James McFerran, Gallatin, Daviess County. In addition to clergy, church officers, teachers, lawyers, and even officers of corporations suffered discrimination by the Radical Republicans as they developed the Constitution of 1865. If they refused to take the oath, they were denied the right to act in their normal capacities. The severity of the Constitution even caused some Radicals to vote against it. The overwhelming insensitivity of the Radicals set stage for their fall. Conservative and moderate Unionists together with Liberal Republicans and politicians of all persuasions elected a Liberal Republican governor in 1870. Through a series of political maneuvers and actions allowing Southern sympathizers to once again vote, the Democratic Party seized control of state affairs in 1874, maintaining state leadership to the end of the century. Civil officials replacing the wartime Federal militia units were often considered weak. The Upper Counties of Northwest Missouri were populated with many Southern sympathizers, now discontent with the Radical state government. Any semblance of positive administration and cooperation between state and local government was for all practical purposes, lost. 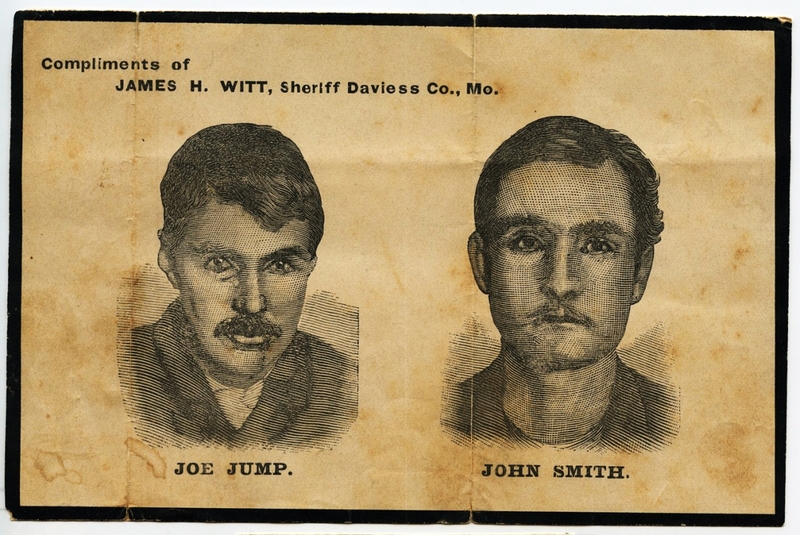 The conditions provided an invitation for the likes of Frank and Jesse James and other outlaws of all or any persuasion to flourish throughout Missouri.